We are back from Bike!Bike! SE raring to go, with Spring in full bloom here. Good for us there are many bike events coming up. Tuesday March 30-Bici Community Interest Meeting! It’s been a year; let’s talk about where we are and where we are headed. We want to hear from you about your interest as well as share ideas that we are hatching…after all this is a Community bike shop. Cantina Tortilla Grill (Dr. Pepper Bldg), 7pm. Buy some tacos and ‘ritas and let’s talk. Bike Lab race! 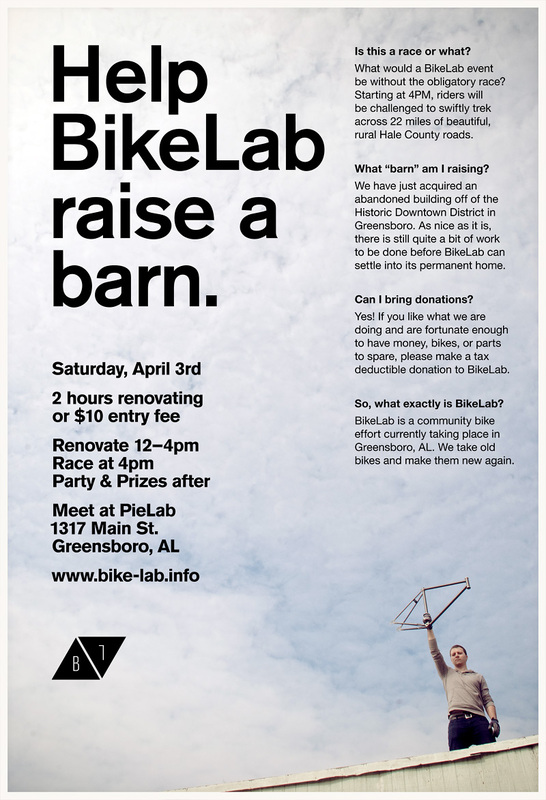 Our friends in Greensboro are having a barnraising race to get their shop ready. As you might remember, I visited Pie Lab earlier this year and fell in love. They are good people doing good things. Support them! A bunch of us from Bham are headed that way, if you want to carpool hit us up in the comments section or send an email.